Become a Volunteer at The Wildcat Sanctuary! Even though we saved Eddy from being euthanized, I sit here next to him in the TWS hospital and my heart breaks. He is beautiful, frightened and unsocialized. He spent over five years as a stud breeder, at a cattery making money for his owner. And yet now, the reward for all his years of service was being surrendered and euthanized. From the outside, Eddy is a stunning cat. But on the inside, he is broken. From the information provided and a little research, Eddy was a prized stud. The website showed his beautiful photos positioned so you could see his rosetted coat. It stated he was worth $3,500 – $5,500. “Pet” kittens were sold on the website for up to $1,200 a piece. If an average Bengal cat litter is 4-6 kittens and if the cat is bred multiple times per year, the amount of profit Eddy must have brought in was substantial. The website also highlighted discounts for what they call “shy cats.” After being removed from the breeding program, the person who ended up with Eddy was told he was a cat that needed “a little work.” Of course he did, he was fearful and unsocialized, like many other breeder cats who have little to no human contact, live their life in a cage only to produce profit. Often they’re given or sold to a good-hearted person who wants to help give them a better life. Though his loving new owner tried for a year and a half, Eddy still would not allow human contact and did not use a litter box. This is very common to the Bengal breed. His new owner contacted the breeder, but she would not take Eddy back nor offered other options. His new owner reached out to several rescue groups in hopes someone could help Eddy. But when all else failed, he was scheduled for surrender and sadly euthanasia, which is what she did not want to happen. Most of the rescue groups called us directly or referred the new owner to us. Our Bengal program was full. We didn’t know if Eddy would merge with other cats, but we did know we had to help. It took two days for his new owner to catch Eddy in a feral cat trap to bring him to The Wildcat Sanctuary. Eddy underwent an intake exam and needed some teeth extractions. 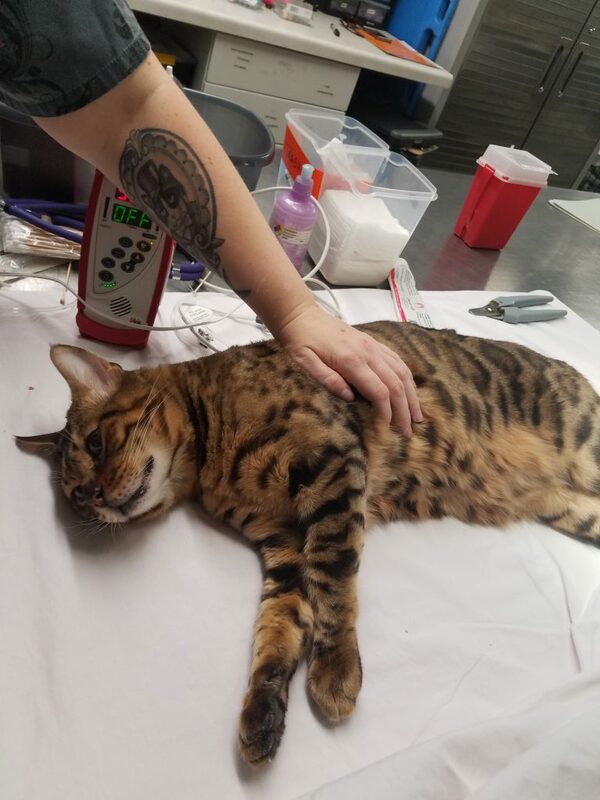 He also had a very high corona titer, which is common in Bengals from catteries. He could possibly begin showing signs of FIP (Feline Infectious Peritonitis) with the added stress of the move. This is a deadly disease with no cure. So sadly, Eddy is spending more time in a kennel in our hospital until we know for sure his future fate. This is why my heart breaks. Eddy deserves more than this. This is the price he pays because he is a beautiful cat. Because so many want designer cats like him. Eddy embodies why we advocate to adopt appropriate pets from a shelter or rescue group. So many cats are waiting to be loved. If we decrease the demand for designer pets, we decrease those like Eddy that suffer, too. Would you like to help today by becoming a sponsor parent to Eddy? Call 320-245-6871 for more information or email us at info@wildcatsanctuary.org or fill out our web form here. We are a 501(c)3 organization. Tax ID: 22-3857401. All donations are tax deductible. The Wildcat Sanctuary (TWS) is a 501c3 non-profit, no-kill rescue facility located in Sandstone, MN. TWS provides a natural sanctuary to wild cats in need and inspires change to end the captive wildlife crisis. As a true sanctuary, we do not buy, breed, sell or exhibit animals. The Sanctuary combines natural and spacious habitats with a life free of exhibition and exploitation, allowing all residents to live wild at heart. The Sanctuary is not open for public visitation. TWS advocates for No More Wild Pets in order to create a world where animal sanctuaries are no longer needed. Read our Disclaimer and Privacy Notice. © 2019 The Wildcat Sanctuary. All rights reserved. Nonprofit Web Maintenance by Byte Technology.